Schmidt Heating and Cooling provides sales and repairs on both standard tank type water heaters and the highly efficienct tankless water heaters. We sell water heaters at up front and affordable prices. 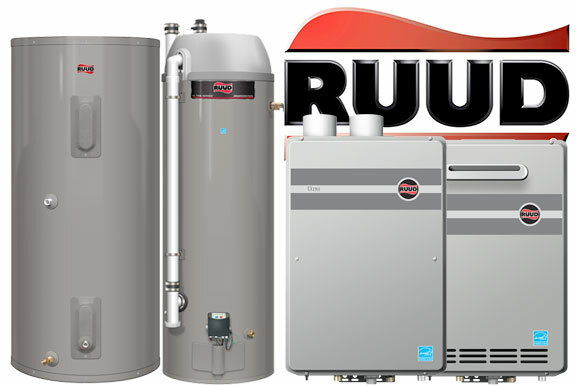 As well as using only the Ruud gas, electric and tankless water heaters, we only use professional quality replacement parts for repairs and guarantee our workmanship and products. A tankless water heater is able to heat water on demand, the hot water never runs out. Tankless systems are usually good solutions for homes with a tub or spa or pool. Especially large families, or bigger homes with higher hot water demands. If you currently have a 46 gallon or higher gallon tank and plan to upgrade, we strongly suggest that you consider the Tankless Water Heater as an option. A service technician from Schmidt's is happy to come out, provide an inspection, and let you know the costs associated with installation of a new tankless water system for your home or business.